Keep it, we couldn’t afford the taxes. 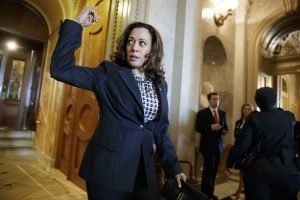 American families making less than $100,000 a year could be eligible for a monthly tax credit of up to $500, or $6,000 a year, under new legislation announced Thursday by Democratic U.S. Sen. Kamala Harris of California. Individuals making less than $50,000 would be eligible for up to $250 a month, $3,000 a year. “Americans are working harder than ever but stagnant wages mean they can’t keep up with cost of living increases,” Harris, a likely presidential candidate in 2020, said in a statement. Harris’ office cited a 2017 survey from the website Bankrate.com that found more than half of Americans cannot afford a $500 unexpected expense, such as a rent increase, medical bill or child care. According to Harris’ office, recipients could receive the money in either monthly payments or annually. “The Institute on Taxation and Economic Policy estimates the (bill) would impact one in every two workers and two out of every three children in America,” according to Harris’ office, in addition to approximately 1 million Pell Grant-eligible college students. Harris’ announcement also included endorsements from several elected officials and organizations, including Alice Huffman, president of the California NAACP, Sacramento Mayor Darrell Steinberg, Stockton Mayor Michael Tubbs and the mayors of Los Angeles, San Francisco, Oakland and Long Beach. Tubbs, has drawn national attention for a “basic income” program that begins next year for city residents. It, too, will offer $500 a month to residents who meet income requirements.